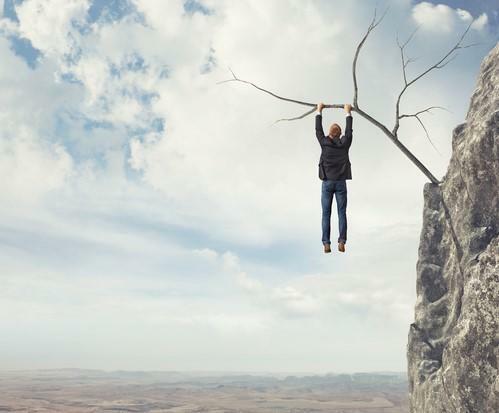 Is Cliffhanger Market Just Beginning? 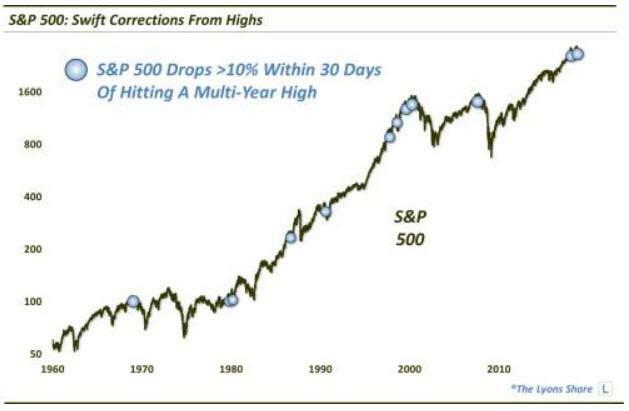 Swift corrections from market highs have, at times, marked the beginning of longer-term bear markets. The recent (ongoing) stock market selloff seems to have blindsided many investors. And perhaps what caught them most off guard was the swiftness of the decline — in particular, given that it was coming directly off of all-time highs in the large-cap averages. Though, we also saw a similarly swift selloff from the January highs, it is relatively rare to see the market sell off this much so soon after hitting new highs. Specifically, at the lows today (October 26, 2018), the S&P 500 was down more than 10% from its late September all-time high. Going back 60 years, this is just the 13th unique time the index has sold off by at least 10% within 30 days of hitting a multi-year high. Below are the dates of the occurrences identified by the blue markers on the chart. If you simply look at the median and % positive returns, it doesn’t strike one as too “scary”. In fact, they are not that far off of normal aggregate returns. However, the risk is asymmetrically skewed. Why do we say that? Because 4 of the prior 12 signals marked precise cyclical market tops. 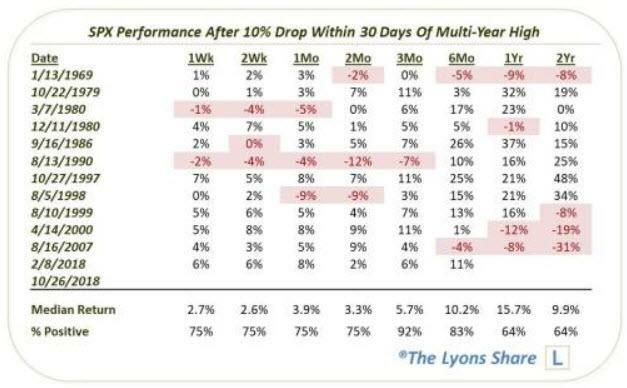 There have only been a handful of cyclical bear markets over this time frame and to have 4 of them marked by these swift corrections from multi-year highs t least gives us pause in assuming the median returns will be necessarily be close to normal, at least in the long-term. Will the current cliffhanger lead to another cyclical bear market? It remains to be seen. There certainly is enough evidence out there, though, to consider that a legitimate possibility. If you’re interested in the “all-access” version of our charts and research, we invite you to check out our site, The Lyons Share. FYI, given the current treacherous market landscape, TLS has extended our CRASH SALE through this weekend. So considering the discounted cost and the current treacherous market climate, there has never been a better time to reap the benefits of our risk-managed approach. Thanks for reading!